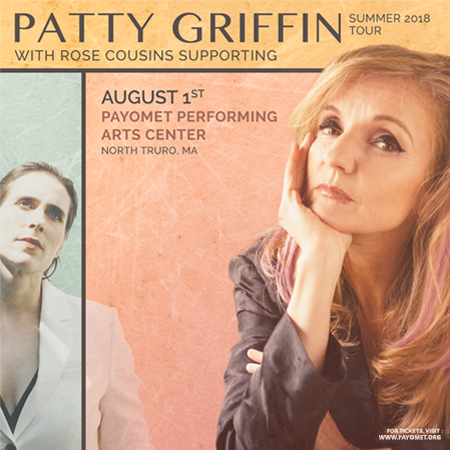 It is our pleasure to have GRAMMY® Award-winning Patty Griffin amongst our ranks in 2018. She is among the most consequential singer-songwriters of her generation, a quintessentially American artist whose wide-ranging canon incisively explores the intimate moments and universal emotions that bind us together. Over the course of two decades, the two-time GRAMMY® Award winner (and seven-time nominee) has crafted nine classic studio albums and two live collections, a remarkable body of work in progress that prompted the New York Times to hail her for "writing cameo-carved songs that create complete emotional portraits of specific people...her songs have independent lives that continue in your head when the music ends." Griffin is respected by her fellow musicians and has had the opportunity to tour with the likes of Buddy Miller, Gillian Welch, Robert Plant, and David Rawlings. Her music has also been covered by many artists such as Lind Ronstadt, Bette Midler, Mary Chapin Carpenter, and Miranda Lambert.